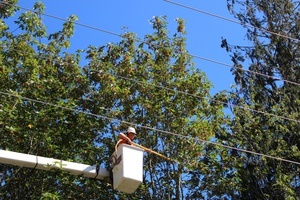 If your home is connected to the PUD’s electricity distribution system by an overhead wire (called a service line), please check periodically to ensure that trees are not growing into the path of the wire. Tree limbs that occasionally brush a service line won’t damage it. But a tree limb or trunk that is pushing a service line out of its normal path should be trimmed or removed. This kind of interference can damage the electrical equipment in your home, or cause an outage for you and your neighbors. Is it Time to Trim? If you see trees growing into your service line, please let us know. We will inspect your service and trim or remove trees that are growing too close. Never trim trees that are growing near your service line; doing so puts you at risk for deadly electrical shock. To request trimming, call (503) 397-1844 and provide your name, service address, phone number and a description of the work that needs to be completed. You may also submit a request for tree trimming using this online form.